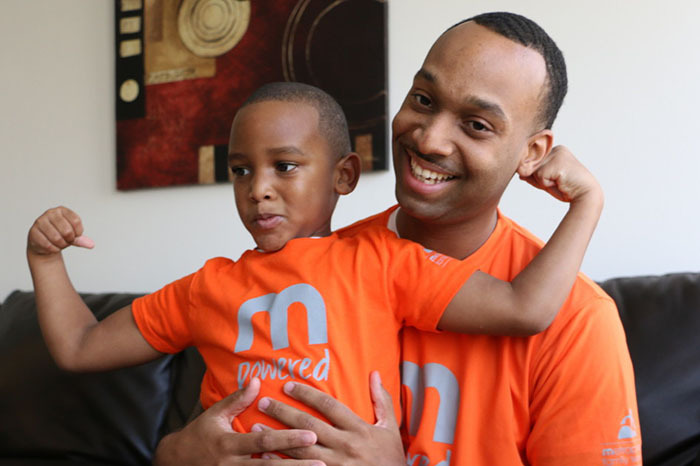 Ryan Reese and his 5-year-old son Ryan Reese, Jr. I grew up in Roseland, the oldest of four siblings. My mother was a single parent. It is extremely hard for a female to teach a man to be a man. There were a lot of things I had to learn on my own. But it’s nice when you have Metropolitan Family Services to give you opportunities. When I was young, Metropolitan offered many services at nearby grammar schools. My mom made sure we participated. We went to programs that promoted family interaction. We did things we couldn’t normally do at home when my mom was away working. It helped us enjoy family time and really brought us together. They presented me with opportunities I didn’t even know existed. I had no idea what was going on outside of Roseland. I didn’t know about college or what I was going to do after high school. I didn’t even know how to interview for jobs. They helped me understand that I could go to college. In 2008 and 2011, I lost two of my best friends to gun violence. It motivated me to try to make a change in the city of Chicago and help kids growing up. I took on the challenge by becoming a Chicago police officer. I have a personal motivation to save not only my own child but others’ children. Your child. Anyone. That’s where it starts. Hopefully, as a police officer I can have a positive influence in our community. There are situations where I’m not only an enforcer of the law; I’m a mentor, a helping hand to influence and let people know they don’t have to lead a negative life.